The UAE-based retail and leisure giant LuLu Group is planning to invest heavily in Sri Lanka in the future, officials said yesterday when the group entered Sri Lanka by opening a US $ 8 million food packaging facility in the Katunayake Export Processing Zone to supply LuLu operations worldwide. “This is a 100 percent export unit for fruits, vegetables, commodities and other FMCG (fast-moving consumer goods) products from Sri Lanka. This is only an initial investment. We are planning to do more,” LuLu Group Chairman and Managing Director Yusuff Ali said at the facility’s inauguration. He will be meeting President Maithripala Sirisena and Prime Minister Ranil Wickremesinghe to discuss the group’s future plans for investments in Sri Lanka during his visit here. LuLu Group Director A.V. Ananth noted that the US $ 8 million investment will multiply several times over when the group invests in a hospitality project under the second stage of LuLu investments in Sri Lanka, while the third stage will bring in one of LuLu’s famous hypermarkets to the island. LuLu subsidiary, Y. A. S. Lanka (Pvt.) 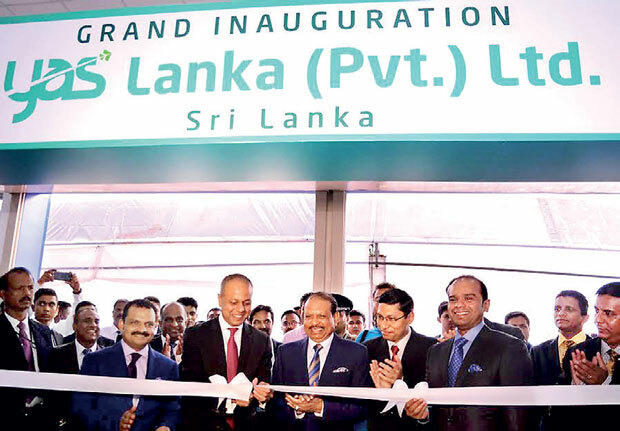 Ltd., under which the packaging plant was set up, is expected to increase LuLu’s product sourcing from Sri Lanka to US $ 10 million in the first year of operations and is expected to reach up to US $ 25 million in annual exports in the future, according to Ananth. “We are hoping to expand our export operations here in the future as well,” he said. The group has already been exporting 3,500 tonnes of products from Sri Lanka worth US $ 5 million annually through various partners. “We have been exporting from Sri Lanka for a while but we wanted to set up our own facility to create synergies, standards and for attractive packaging. This will be the largest such facility in Sri Lanka,” Ali said. The Abu Dhabi-based group recorded an annual turnover of US $ 6.9 billion in 2016 and operates in 32 countries. It owns 134 hypermarkets, supermarkets and department stores and also has investments in shopping malls, hospitality and travel, shipping and import-export operations. According to Forbes, Ali is currently ranked as the 367th richest man in the world, worth US $ 4.9 billion and is India’s 25th richest individual.